Werner's Cairns blog: The coconut; loaded with nutrients & health benefits. The coconut; loaded with nutrients & health benefits. The Coconut; it is a symbol of the tropics. We have always enjoyed eating the meat of the coconut, but lately the water and the oil of it have come to the fore as health food. Our daughter introduced me to a delicious treat: Put Virgin coconut oil on toast, add honey and bananas and sprinkle cinnamon on top of it – absolutely yummy. This nut used to be considered a major nutritional no-no, but lately has come into the limelight as being beneficial for health, and is touted for weight loss benefits. The question often asked: Is a coconut a fruit, nut or seed? Botanically speaking, a coconut is a fibrous one-seeded drupe, also known as a dry drupe. However, when using loose definitions, the coconut can be all three: a fruit, a nut, and a seed. 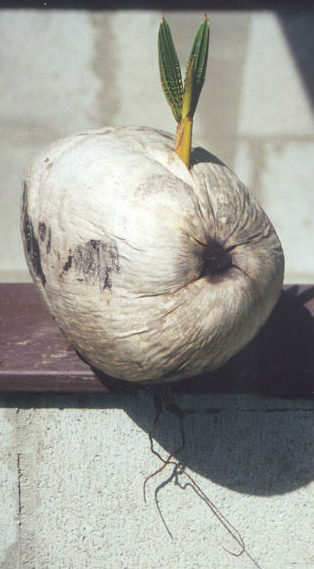 Picture: One of our coconuts with leaf growth and roots at the bottom. 1. Thyroid-stimulating: Research shows that coconut oil contains a medium-chain of fatty acids to accelerate and to stimulate the metabolism that gives you more energy. 2. Get candida in check: Coconut oil has a good quantity of caprylic acid in it which is well known to kill off excess candida by targeting harmful bacteria. 3. Lowers cholesterol: It is rich in lauric acid which protects your heart by reducing total cholesterol and increasing good cholesterol. 4. Helps with weight loss: Here is an interesting fact about coconut oil; even though it is a fat, it actually helps with weight loss! Read more here: Weight Loss With Coconut Oil. The healthy medium chain fatty acids do not circulate in the bloodstream like other fats; they are sent directly to the liver and are converted into energy. Thus the body does not store the fat in coconut oil as fat; it uses it to produce energy instead. 5. Helps keep diabetes in check: It does not produce an insulin spike in your bloodstream. Instead it helps control blood sugar by improving the secretion of insulin. 6. Reduces heart disease: studies on people in the Pacific Islands found that their total caloric intake included thirty to sixty percent from fully saturated coconut oil. These Pacific Islanders have nearly non-existent rates of cardiovascular disease. 7. Gastrointestinal malabsorption diseases: Combining Vitamin E supplements with coconut oil through the skin proved to be a good alternative for those with gastrointestinal malabsorption diseases. 8. Supports the immune system. It is rich in lauric acid, a nutrient that supports the body’s immune system. 10. Nourishing for the brain: Studies show that it improves cognitive function, and stalls, or even reverses, neurodegenerative diseases in their early stages. 11. Ancient medicine: Coconut oil has been part of Ayurvedic medicine for 5,000 years in India. 12. Speeds Recovery: People in Panama drink a glass of coconut oil to protect themselves from illness as it is also believed to speed recovery from sickness. Read about the numerous research studies done on coconut oil: Coconut Oil Research.“Approximately 50% of the fatty acids in coconut fat are lauric acid. Lauric acid is a medium chain fatty acid, which has the additional beneficial function of being formed into monolaurin in the human or animal body. Monolaurin is the anti-viral, antibacterial, and antiprotozoal monoglyceride used by the human or animal to destroy lipid coated viruses such as HIV, herpes, cytomegalovirus, influenza, various pathogenic bacteria!” according to research by Dr. Mary Enig. Coconut water nutrition facts: Coconut water is the juice in the interior or endosperm of young coconut. Its water is one of the nature’s most refreshing drinks, consumed worldwide for its nutritious and health benefiting properties. The water is actually obtained by opening a tender, green, healthy, and undamaged coconut. Inside, it's clear liquid is sweet, and sterile and composed of unique chemicals such as sugars, vitamins, minerals, electrolytes, enzymes, amino acids, cytokine, and phyto-hormones. 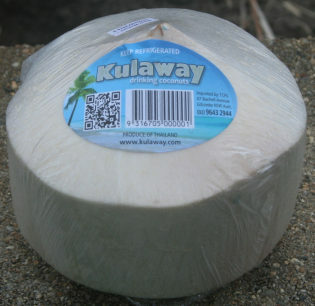 In general, young and slightly immature coconuts harvested when they are about 5-7 months of age for the drink. Each nut may contain about 200 to 1000 ml of water depending on cultivar type and size. Any nuts younger than five months of age tend to be bitter in taste and devoid of nutrients. In contrast, mature nuts contain less water, and their endosperm thickens quickly to white edible meat (kernel). Coconut milk obtained from the meat therefore should not be confused with coconut water. Coconut palm flourishes well along the costal tropical environments. A coconut tree may yield several hundred tender nuts each season. Different species of coconut palms are grown all over the tropics. Naturally, their taste and flavor of water show variations according to saline content in the soil, distance from sea shore, mainland, etc. Coconut water has been generally offered to patients with diarrhoea in many tropic regions to replace the fluid loss from the gastrointestinal tract and reduce the need for intravenous therapy. The osmolarity of tender coconut water is slightly greater than that of WHO recommended ORS (Oral Rehydration Therapy) osmolarity. Presence of other biological constituents like amino acids, enzymes, minerals, and fatty acids may account for this higher osmolarity. However, unlike WHO-ORS, its water is very low in sodium and chlorides, but rich in sugars and amino acids. This well-balanced fluid composition with much-needed calories would be a more ideal drink than any other brand of soft drink beverages in dehydration conditions. Coconut water is composed of many naturally occurring bioactive enzymes such as acid phosphatase, catalase, dehydrogenase, diastase, peroxidase, RNA-polymerases etc. In effect, these enzymes help in the digestion and metabolism. Despite very light consistency, its water has much better composition of minerals like calcium, iron, manganese, magnesium, and zinc than some of the fruits like oranges. Coconut water is readily available at supermarkets. Its water is also a very good source of B-complex vitamins such as riboflavin, niacin, thiamine, pyridoxine, and folates. These vitamins are essential in the sense that the human body requires them from external sources to replenish. Coconut water contains a very good amount of electrolyte potassium. 100 ml of water has 250 mg of potassium and 105 mg of sodium. Together, these electrolytes help replenish electrolyte deficiency in the body due to diarrhoea (loose stools). Further, fresh coconut water has a small amount of vitamin-C (Ascorbic acid); It provides about 2.4 mg or 4% of RDA. Vitamin C is a water-soluble ant-oxidant. Meat from young coconuts or (a.k.a green coconuts) is very creamy and gelatinous. It looks and feels like jelly because you can eat it with a spoon. This is the type that is often fed to babies as they are weaned from their mothers’ breast. Young coconut meat spoils more quickly than mature meat. This is why it’s rare to find it outside of tropical locales. In this way, fresh meat from coconuts is considered a functional food. By eating it you accomplish two important things for your body: You feed the body a high quality food source. It functions in specific ways once inside the body (i.e. feeds the good bacteria in the intestines). A few of the health benefits that can result by consuming fresh meat consistently are: It helps to regulate digestion and elimination. It assists in weight loss. It's a powerful germ fighter. Almost half the weight of fresh meat comes from water. It also contains less sugar than meat from other fruits like oranges or apples.The mineral levels of iron, phosphorous and zinc are high. Mature meat keeps longer than younger meat but is still perishable. It must be stored in the refrigerator or freezer to maintain freshness. How to make a comment? Read annotation below. It's good to know this delicious food is also so healthy. Yet many doctors advise heart patients to avoid it because of the saturated fat. It's time for the medical profession to take a closer look at this, in light of recent research. The native populations who inhabit the South Pacific Islands and Papua New Guinea, have known, for generations, the value of the coconut. Try cooking bananas in coconut milk - yummy - also by adding coconut milk to rum, no hangover the next day. Taken for medicinal purposes only, of course. I have been fighting my mother in law for years over this topic. She is adamant that she consume no coconut in any form because it is really really bad. One time at Smithfield Markets she got really upset because I bought some oil.I use it for cooking mostly but Grant and I are both very keen on the new Coconut Essence (water) that we can buy at Johnson's Food Market. A good article, I am sending it on. Thank you, Werner, for this very interesting and informative posting. I certainly learnt something valuable. Jane - Cold pressed oils are much healthier than those that have been extracted using heat or chemicals, which destroy the nutrients in them. Hydrogenated oils (as used to make margarine and in many processed foods) are also very unhealthy. Dr Sandra Cabot gives a very good explanation of the problems with vegetable oils that are usually promoted as healthy (like Canola) in her book, "Cholesterol - The Real Truth." I found this posting very interesting. I had no idea about health benefits of this humble nut. I certainly will get the water and the oil, and try the “treat” from your daughter; it looks appealing to me. You stressed “cold pressed” could somebody explain why this is better than ordinary palm oil? Epson Salts; an amazing substance.